I was feeling a bit stuck today, sort of blah. 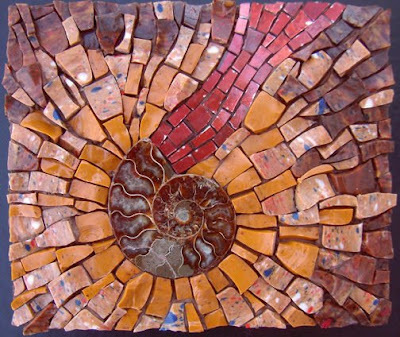 Went to my treasure chest of mosaic materials and discovered the ammonite fossil I'd been saving was broken. More blah. But then I realized, "Wait, I'm a mosaicist, I can put it back together!" And so I did, and surrounded it with Eco smalti and colored mosaic gold, two of my favorite materials, which made me feel better. I'm on your list to receive your "Mosaic of the Day". They've been inspiring to see! Thanks for doing this. It's great to see your freedom in creating. This is the farthest thing from blah I've ever seen.